The country’s stock market has hit record highs. 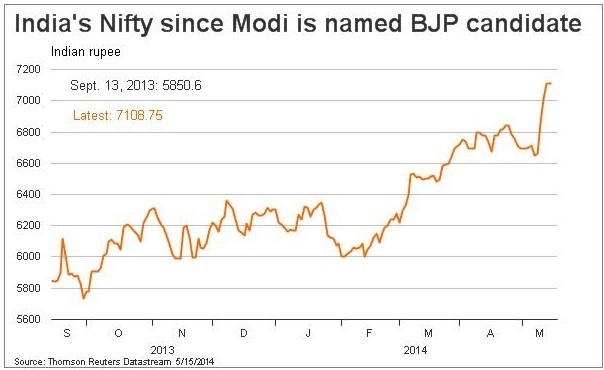 But if Narendra Modi’s BJP seals a decisive victory, shares could keep rising. Investors may be wary of reading too much into dodgy exit polls. Valuations are full but not crazy. And foreign funds probably have more cash to deploy. Narendra Modi is on track to become India’s next prime minister, four major exit polls showed on May 12, with his opposition Bharatiya Janata Party (BJP) and its allies forecast to attain a parliamentary majority in the world’s biggest election. Results are due on May 16. India’s stock market has rallied sharply in recent months. The CNX Nifty index closed at 5,851 points on Sept. 12, 2013, the day before the BJP named Modi as its prime ministerial candidate. On May 13 it closed at record 7109.